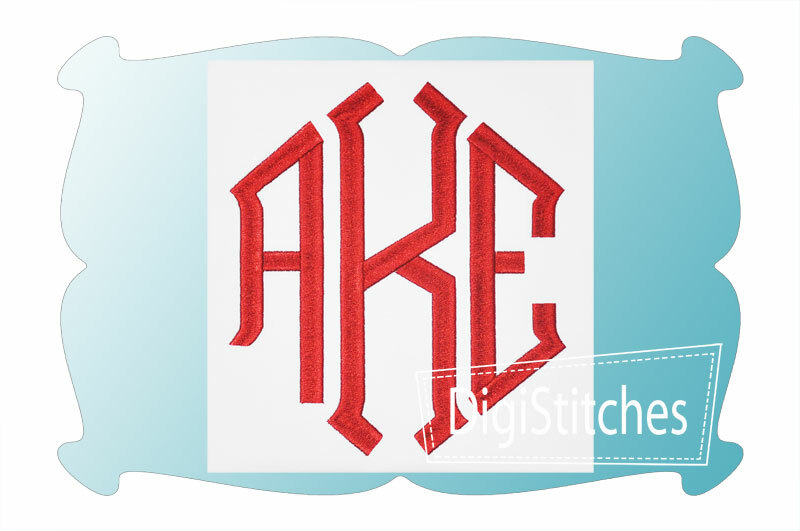 A beautiful point/ diamond monogram embroidery font in larger sizes. Capital letters A thru Z, with left, middle and right letters to form a point/ diamond shape as shown. 5 sizes included: 4.00, 5.00, 6.00, 7.00 and 8.00 inches Size refers to tallest height of the middle letter in the set. 4.00 inch: 3.24 x 3.90 inches. SC: Avg: 969. Satin stitch. 5.00 inch: 4.39 x 5.00 inches. SC Avg: 10,827. Split satin stitch. 6.00 inch: 5.28 x 6.00 inches. SC: Avg: 13,469. Split satin stich. 7.00 inch: 6.16 x 7.00 inches. SC: Avg: 17,435. Split satin stitch. 8.00 inch 6.58 x 7.80 inches. SC: Avg: 20,644. Split satin stitch. Commercially licensed for embroidery digitzing. This design is included in our April, 2019 Sale. We now proudly offer the entire Digistitches design collection! Capital letters A thru Z, with left, middle and right letters to form a point shape as shown.